When I compare files many are given as different as the source: time is one hour ahead. I tried also to ignore daylight savings and/or timezone differences but nothing changed. I'm using the latest 64 bit Version 4.2.6 (build 23150). The knowledge base article is a bit out of date, and we'll need to fix that. The core issue is that Explorer and the command line calculate the timestamps differently. The command line shows dates based on whatever the current timezone offset is regardless of the file's time. Explorer shows uses the offset active when the timestamp is set to. Our long term plan is to change the behavior to always match Explorer and use the appropriate DST offset for each timestamp. At that point the "Ignore daylight saving difference" setting should largely be obsolete. Unfortunately, the current behavior of a single offset affects basically all of our date handling throughout BC, so fixing it isn't trivial. It's on our wishlist, and is something we actively want to fix, but it's had to take the backseat to other high priority work. For now, the "Ignore DST" setting will make BC treat the two timestamps as equal, but there's no way to adjust the display itself. If the setting isn't working for comparison purposes, please let us know how. This option does not intend to update or alter the timestamp value, but if it is aligned to the same file that is off by one hour (because it is a different source that isn't hitting the same issue), then it would ignore that specific, 1 hour difference in timestamps. Yes, I know but it didn't do what I wanted. - The files on the network folder had one hour difference. Session Setting -> Ignore Daylight Savings does not make any difference. Would it be possible to add a new option in BC for Windows: Windows Daylight Savings? If you open a command prompt and run DIR on the same folder, does the time match the display in Beyond Compare? Windows Explorer in newer versions of Windows displays file times based on if daylight saving time (DST) was on or off at the time of the file timestamp. Beyond Compare displays time based on if DST is on or off at the time you're displaying the file time. DIR in a command prompt should match Beyond Compare's behavior. The time in DIR match the display in Beyond Compare. But how can I resolve all these conflicts? Thanks for the report. What type of device is Y:\? Is every file present showing the one hour difference between Windows Explorer and BC4? Please note that BC4's timestamp is the Last Modified timestamp (not Created, but still an hour off). 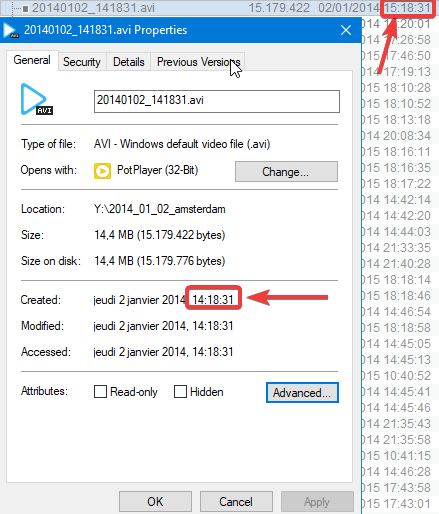 If you load up Windows Explorer, this shows a matching timestamp to Properties or BC4? - Y is a network folder on another PC. - Not every file present showing the one hour difference between Windows Explorer and BC4. Last edited by Rando; 11-Oct-2018, 02:42 AM.